When I'm asked what someone can do to be a leader I tell them to love, serve and care and positively influence the people around them. A great example of this is Ken Crenshaw, the head athletic trainer for the Arizona Diamondbacks. Most people outside the building wouldn't know who he is but if you asked the team who's one of the most influential people in the building they would say Ken Crenshaw. He helps players recover from injuries, listens to their personal and professional challenges, shares advice and frequently hands out inspirational books (some of mine) to encourage his players. He's part trainer, part psychologist, part librarian and 100% leader. I saw his influence first hand while visiting him at the Diamondbacks spring training facility the other day. As he showed me around, I met player after player who had read The Carpenter or Training Camp because Ken gave them a copy and encouraged them to read it. They didn't know me from Adam. But they knew Ken and trusted him because he loves, serves and cares. I wasn't supposed to speak to the team but that happened too because Ken recommended it to the new manager, and even though he had never heard of me, he trusted Ken's suggestion. Regardless of your profession or level within an organization I want you to know that you don't need a title to be a leader. You don't need a job description, fancy suit or a corner office. You simply need to love, serve and care to influence the people around you and your influence will grow. 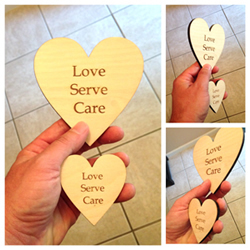 Purchase these wooden hearts engraved with "Love, Serve, Care" as a reminder for yourself and/or your team of the greatest success strategies of all. Give them as a gift to encourage others as well. 100% of all proceeds are being donated to charities such as "Homes of Hope" and "Restore International." Discover the power of love, serve and care with the Carpenter Video Training Program. In this 40-minute, 8 module video training (accessible via DVD or Online) I share strategies and lessons that will inspire you to build a better life, career, and team by utilizing the greatest success strategies of all. There's no such thing as an overnight success but there are timeless principles to help you stand out, excel, and make an impact on people and the world. PRE-ORDER SPECIAL LAST DAY: As an exclusive for my newsletter subscribers and community, we're extending a special pre-order discount if you order before midnight tonight on March 13, 2017. Get details and order here.